With Scholarships, Youth Programs, Veterans Activities, Christmas Giveaway, Easter and more. Yes, our clubroom is quite comfortable. Play some games, meet great new people. As a local lodge, we are part of the California-Hawaii Elks Association along with over 168 lodges in 19 districts throughout the two states. 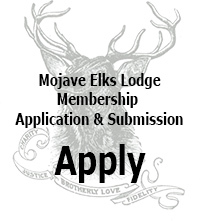 we invite you to get in touch with us to see about membership in the Benevolent and Protective Order of Elks. 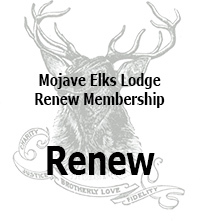 By size, Mojave Lodge is considered a smaller lodge. Many of our members live in other parts of the country due to the nature of employment in our area: We are blessed to be surrounded by forward-thinking companies such as Mojave Spaceport, Scaled Composites, Golden Queen Mining, and Edwards Air Force Base. And Just down the road, we also have Pete Knights Veterans Home providing residence to some of America’s finest servants. We encourage you to watch this video for a brief overview of the caring and support throughout the organization. To inculcate the principals of Charity, Justice Brotherly Love and Fidelity: To recognize a belief in God; to promote the welfare and enhance the happiness of its Members; to quicken the spirit of American patriotism; to cultivate good fellowship; to perpetuate itself as a fraternal organization, and to provide for its government, the Benevolent and Protective Order of Elks of the United States of America will serve the people and communities the benevolent programs, demonstrating that Elks Care ~ Elks Care.